Customising convenience – oxymoron or genius? At first glance it seems to be an unlikely coupling - customisation from the king of convenience. McDonald’s, the brand and the experience is synonymous with fast food, value and above all else, consistency. The same great (debatable) taste no matter which country, city, suburb, time zone or year you find them in. But hold the line. They’ve brought to market a premium, tasty, personalised meal. It’s not new, it’s not innovative but hats off to a job extremely well done. It provides the trifecta of customer experience - accessibility, choice and differentiation. They’ve taken the mundane, no surprises Maccas experience we love to hate and elevated it to something interesting, sensory, yet comfortingly familiar. On entering the store you find a line of large format digital screens with “Place your order here” emblazoned across the pixels. Then you start creating your own burger by touching the images and words on screen to select your ingredients. It’s really that simple. 2. Get saucy - a range of different sauces - BBQ, tomato, chipotle mayo, aioli, garlic, honey mustard, pesto mayo. The list goes on and on. 4. Turn up the taste - add bacon (crispy or rasher), eggs, mushrooms, tortilla chips and guacamole. 5. Make it cheesy - Swiss, cheddar, mozza, Parmesan, whatever takes your fancy. There’s even a diet and allergy requirements section and the touch of a button shows you what ingredients are vegetarian and gluten free. You can choose to pay by Eftpos at the kiosk or at the counter and then take your numbered docket and clip it to your chosen seat or you can watch your meal being created at an open serve-over with all the fresh ingredients displayed. The chefs wear “Create you Taste” branded black aprons and chefs caps, standing out from the regular staff. 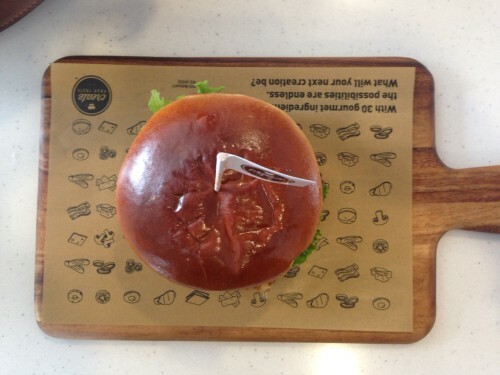 Your burger is brought by wait staff on a wooden board, piping hot with a flagged kebab stick. What does it mean for Maccas? More moola: The obvious difference is the price of the burger which is based on a base cost plus the ingredients you add to your creation. While a normal Chicken burger can set you back around $8 my burger was $13.50. For the sake of research I sacrificed my newly implemented diet plan and ordered a grilled chicken burger on a brioche bun with grilled pineapple, caramelised onions, lettuce, Swiss cheese and pesto mayo. Customers are enjoying this new experience, the store is increasing average spend per customer and new customers are being enticed in the door. Result. Offer shift: I don’t think a huge overhaul of in store systems would have been required to implement this new offering – a few more staff, increased stock orders and possibly different cooking techniques, but I bet they didn’t need to change very much. The key parts were already mostly there. Engaging experience: The real beauty lies in the fact that this isn’t new news but McDonalds appear to be owning it. Think Tank, Pita Pit, Subway, Dominos, or just about any fast food joint you can think of, have been “making your meal” forever. But take an existing concept - modernise it, make it just a little bit cool, stick it into a different category with a twist and hey pesto (I couldn’t resist), instant hit! The store was pumping for a late lunchtime mid-week. I could barely find an open seat and at a guess 80% of the customers were ordering and feasting on customised burgers. If I had to be picky, my only critique would be that the experience was a little disjointed. It just didn’t taste like Maccas. At all. Which I found surprisingly dissatisfying for this wannabe health junkie. If you’re an original Maccas aficionado then ‘Create your Taste’ might not be to your taste. But if, until now, Maccas has never been your thing, you should get right in and buy to try. Oh and of course rate your experience through their new ‘mymaccas’ app. Kiosks have become all the rage in the QSR segment as I saw first-hand recently in the US. As Fiona has highlighted the self-service nature do provide a new “edge” to the existing offer and this has incredible appeal to digital natives who often don’t want to talk with the sales person behind the counter. They want to control the experience on their terms. Kiosks are help manage demand in busy periods. I for one know that when I enter a Maccas with my kids the line often makes me want to weep. But this innovation has helped retain me rather than my quick negotiation with my kids that I will give them a pony if we leave and eat somewhere else. This post was republished from Hotfoot's blog, retail geek.